We’re delighted to have picked up a major insurance award for our continuous innovation and high standards. Beating off some stiff competition, we were crowned the UK’s Schemes Broker of the Year 2016 in front of hundreds of insurance industry figures at The Brewery in London. 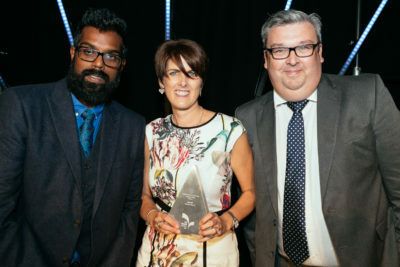 Our PR and Communications Manager, Liz Harrison, was presented with the winning trophy at the UK Broker Awards by the event’s host, Romesh Ranganatha, and award sponsor, Lee Turner, of Hiscox Insurance. Caravan Guard’s Managing Director, Ryan Wilby, said the whole team was thrilled they’d received national recognition for their continued efforts to provide exceptional service. The Caravan Guard and Leisuredays teams were also very proud to have been a finalist at the British Insurance Awards for UK Broker of the Year in June. Click for more information about our caravan or motorhome insurance or call 01422 396 769.